You wake up to find yourself in a strange place, with no inhabitants, and more importantly, with no recollection of where you are or how you got there. You walk around this strange land and find a note from an archaeologist that says he is responsible for bringing you to this remote land against your will. You also learn from this cryptic letter that your task is to help his exploration and to uncover the mysteries of the forbidden world called Gwan Quer’nelok, or Quern for short. This is the plot of Quern, a new game developed by Zadbox Entertainment. 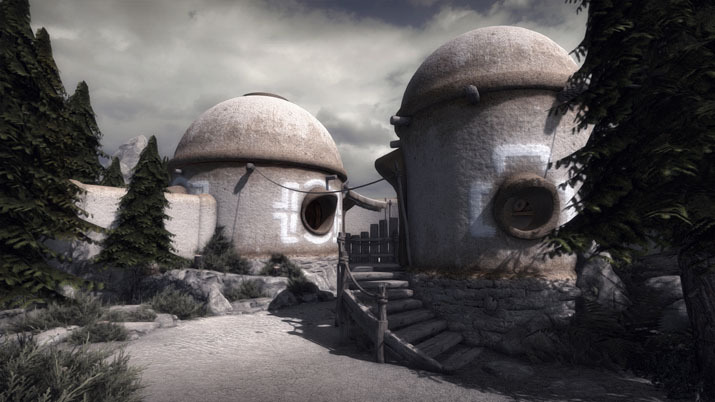 From exploring Quern for a mere fifteen minutes you realize just how much effort Zadbox Entertainment put into designing the world. These designs and the layout of Quern make you really feel like you are an explorer of the legendary forbidden city. Even without any sign of life, the exquisite graphics that went into building the city’s architecture and environment make for a great world that draws you in and makes you want to keep exploring. Where are the people? What does the archeologist want you to discover? What are the secrets the island holds? 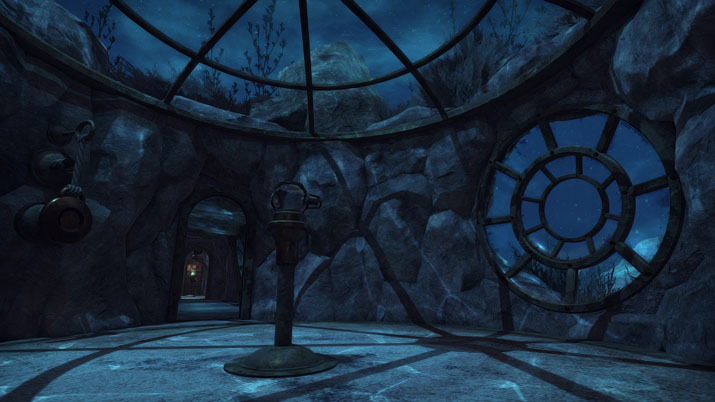 Quern is played in the first person viewpoint and significantly adds to the feeling that you’re actually there exploring the world. When you wake up for the first time on the island, you are a little groggy and the camera helps to make that experience come to life. The first person viewpoint also emphasizes the mystery and suspense of the game. You start to feel lonely and it transfers to your psyche through the screen. Sometimes I even felt like someone was following me because it was so empty, and I constantly kept checking my back just like I would in real life. 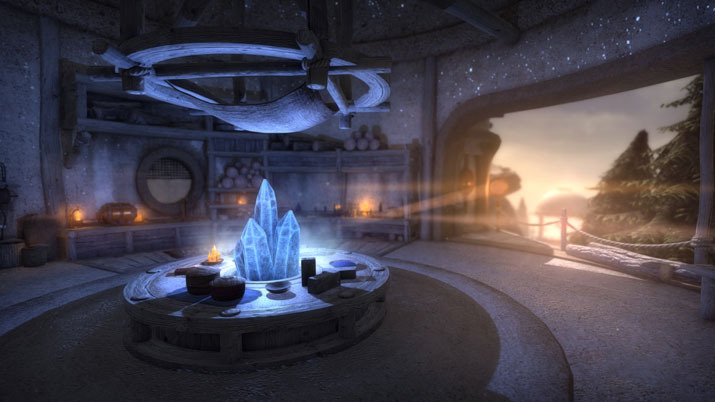 While the visuals are great, the sounds you experience in the world are truly what make Quern come to life. You can hear your own footsteps as you investigate the island. You can hear the water flowing and hitting the shore when you get close to it. You can hear the doors creaking or the sound of the wooden boards under your feet. When there are no relevant noises to be heard, the tribal music that plays throughout gameplay is entertaining and at points soothing when you’re working on a difficult puzzle. Sometimes it was the only thing that kept me energized when I was failing at a challenge. It is also clearly evident that Zadbox Entertainment spent a lot of time and energy developing the puzzles. Quern is definitely not for people that get irritated when they can’t figure out a puzzle, but is an excellent challenge for those that love brainteasers. You collect letters throughout the world that were left for you by the archaeologist and he describes some of the mysteries of the island. However, other than these ambiguous letters, there is very little guidance on what you are looking for or what your objectives are. There is no hand holding in this game and you will have to use that wee brain of yours. Most of the time you will be running around confused and clicking everything in sight just to figure out what the next objective is… and then you have to actually figure out how to accomplish the objective. A good design asset is that you receive a handy dandy notebook from the archaeologist that allows you to “draw” (more like screenshot) relevant clues for later use so that you don’t waste your time backtracking. These puzzle elements make Quern the scavenger hunt of all scavenger hunts and you have to be extremely observant in order to figure out the clues left for you by the devious archeologist. The clues and challenges presented throughout the world are much like the ones in real-life Escape Rooms, which is why I really enjoyed them. Sometimes you have to use a black-light tool to find hidden messages left by the archaeologist, and sometimes you even need to build your own lock and keys. Each completed challenge either opens up another puzzle or leads you to a new area to explore, just like in Escape Rooms. This makes it extremely rewarding when you complete challenges. Ultimately it will likely take you over twenty hours to completely uncover the mysteries of Quern, rather than the hour it takes for a real-life Escape Room, and for the same price, it makes it well worth it. The only negative thing I have to say about Quern is that sometimes it glitches. The world takes a very long time to load initially and sometimes I had to restart because it kept freezing when it finally did load or sometimes I got caught on something invisible. Also when I first started playing I had to adjust the camera sensitivity because anytime I slightly moved the mouse, I got extremely dizzy from how fast the world was spinning. The motion blur, which seemed unnecessary for this genre, is so high at times that it sometimes made me nauseous. Quern is also currently only at partial controller support, but I don’t believe that having a controller would be any more beneficial. All in all, Quern is the ultimate scavenger hunt, and perfect for any exploring puzzle master. It is great for its genre and definitely a must have if you love brainteasers, exploration, and uncovering mysteries. Not only is it filled with challenging puzzles, but it also incorporates aspects of an exploration game. You are not going to complete the game by simply staring at the puzzles, but instead need to explore the wonderfully designed world of Quern. Zadbox Entertainment very elegantly integrated cryptic puzzles into a well-designed and even more cryptic world that any challenge seeker would love to explore for hours on end. My advice to you… leave no stone unturned and CLICK EVERYTHING. Good luck!